The thing that stunned me was the closeness of the correlation. For you math geeks, the correlation coefficient of the two data sets is 0.93! The next thing that's fascinating is that changes in the Food Price Index appear to lead changes in the price of oil by a few months. 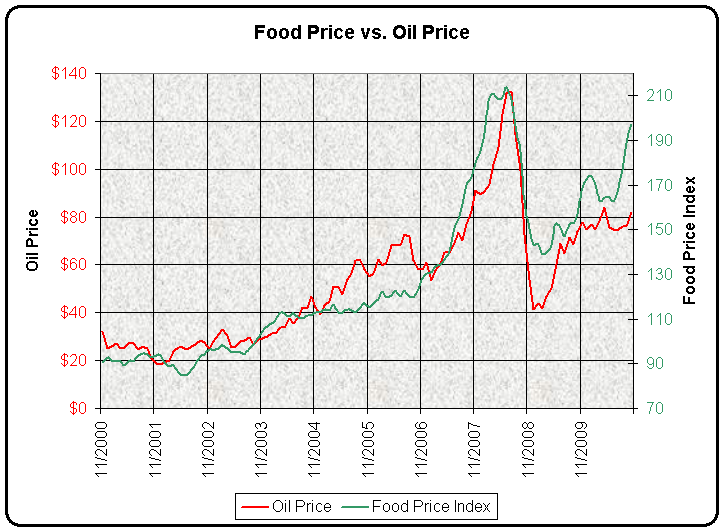 Since food prices don't drive oil prices as far as I know, this implies that they are both responding to the same underlying situation, but that food prices are a more sensitive indicator. The last thing that I noticed is the behaviour of food and oil prices in the last six months. 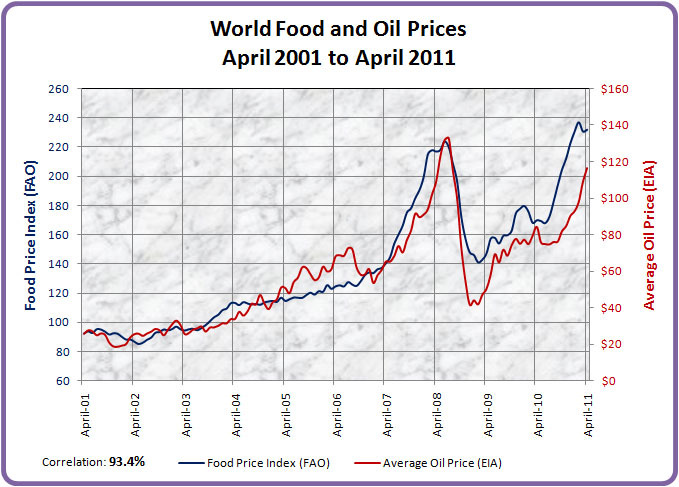 The sharp rise in food prices is being noticed in the media now, but the graph hints that the story is just beginning. It's now May, 2011. I wanted to re-do the graph to check whether the correlation is holding. If anything, it's getting a bit stronger. The sharp rise in food and oil prices that the previous graph hinted at in November has in fact materialized over the last six months. This article may be reproduced in whole or in part , in any manner and for any purpose whatsoever, with no restrictions.